The Arkansas Horseshoeing School has 8, 12, 16 and 24 week courses for prospective farriers. Many students come from states all across the U.S., because of the reputation of the school and faculty. NOTE: We can only accept students living in the United States. Financial Assistance – Post-9/11 GI Bill Veterans Benefits accepted. Please check with your local VA office to see if you qualify. Note: The $500.00 deposit is not required if you will be using your VA benefits. Jacey Broussard, CF, owner JC’s Hoofcare and a Arkansas Horseshoeing School graduate. ** See more student comments here. 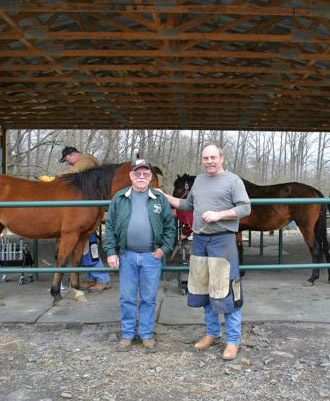 Paul Dorris Jr. founded the Arkansas Horseshoeing School and both he and his father are instructors; together they have 75+ years as journeyman farriers. To round out the faculty they asked another exceptional professional to teach at the school – a veterinarian. farrier school to be as much like an apprenticeship experience as they could manage. Whether you’re in an anatomy class, under a horse, or out in the field working with one of the faculty, you’re always working with the guidance of an expert. Paul Jr. has a long list of accomplishments. In early October 2010 he was an Official Farrier for the Eventing Division of The World Equestrian Games, where top equine champions from over 50 countries gather every four years to compete. This 2010 WEG is the first time the U.S. has been chosen to host this prestigious event.. Over 500,000 attended and it was covered by NBC Sports. For fourteen years, he’s also been an official farrier at the Rolex Kentucky Three Day Event, also a Four Star Event like the World Games and the Olympics. Paul’s father, Paul Sr. was also an official farrier at Rolex for years. It says a great deal about their reputations that father and son are entrusted with horses of this caliber. We’re proud of our farrier courses. A great deal of collaborative effort among the faculty went into designing their content. In addition to the foundation of knowledge in horseshoeing and the business end of things, we’ll also teach you how to maintain your health, concentrating on safety and on how to minimize wear and tear on your body. We always assist students in finding apprenticeship positions after they finish our program. The success rate for graduates of any school sky rockets when apprenticeship is combined with formal education. We take a personal interest in each individual we work with and enjoy talking with prospective students to answer questions and help them find what they need in a formal education in horseshoeing. you make an informed decision when evaluating farrier schools. Check back often for frequent changes and updates.